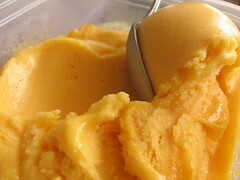 Mango-Passion Fruit Sorbet - Do You Know The Muffin Man? Notes: Another resident in my freezer was a container of frozen passion fruit pulp which I scooped from several ripe specimens a few months ago (or was it longer than that?). I used a food processor to free the pulp from the seeds (which stayed intact) and combined it with fresh mango puree, following the guidelines from two different recipes in this book. The use of egg white was something I hadn't used before in a sorbet; it's supposed to prevent the sorbet from melting too quickly. I found the texture of this sorbet to be very smooth, and its taste to be quite pleasant, neither fruit dominating but complementary. One tip the authors note is that the only way to make a bad passion fruit sorbet is to make it too strong.